Care Day 2018 saw a packed day (and evening) of celebrations, conversation and ceilidh dancing. The Review Secretariat and 1000 Voices teams were delighted to be invited along to the fabulous Carelidh event at the exquisite Barony Hall, Glasgow. The Carelidh, in its second year of running, created a fun-filled space for care experienced young people to come together from across Scotland to connect and have a good old dance! And there was some fine dancing to be seen. The young people at the event were invited to join the Review in a room where they could chill out, get creative or just chat. 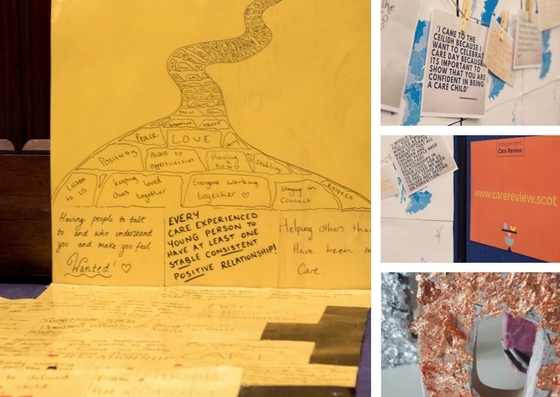 1000 Voices exhibited displays that young people designed and contributed to during the Discovery stage. Activities were planned by the team so that young people could express their voice through digital creations or cool down whilst crafting with decoupage. The evening was not only filled with creativity but also conversation. Review Chair Fiona Duncan, along with the 1000 Voices team, had the pleasure of meeting lots of new faces and listening to what young people had to say. One thing’s for sure there is real excitement around the next stage of the review, the Journey stage. We’d like to thank the young people who attended the Care Day celebrations for making our first Carelidh so memorable. We had a fantastic night and can’t wait to dust off our dancing shoes next year.